♦ Offer both Single Start & Miiti Start Hobs well Designed on CAD File so that it Generates the Accurate Spline. - M/S Subham Products, offer a wide range of micron Hob Cuttter that are available in customized as well as standard designs per client requirements. - We offer involute hob cutter for mikron Hobbing cutter with shortest lead time as the Blanks are ready in stock. Gear Hob Cutters in Ground Profile. Made for all Module and DP sizes. Made in HSS M2 and M35 material. 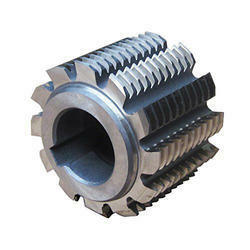 SHB manufacture Gear Chamfering Cutters to chamfer the flank edges of Spur and Helical Gears. The Chamfering operation prevents edge distortion during Heat Treatment and protects the profile during handling. We design and produce hobs for high speed wet and dry cutting giving multiple benefits to users. 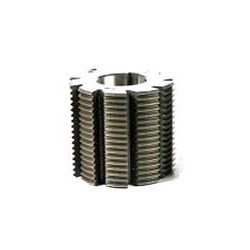 These are produced in bore & shank type and are generally used for components having high volume on CNC hobbing machines resulting in substantial reduction of cutting time. We provide a wide collection of worm wheel gear cutting facility. Gear Cutting Tools, Gear Cutting Hobs, Spline cutting Hobs and Chain Sprocket Hobs. Hobs are made from selected High Quality High Speed Steel grades. With all manufacturing operations like Machining, Profile Releiving, Heat-treatment, Grinding and Sharpening are done with world class machinery and equipment.